I’ve been so lucky with the growth I’ve seen on my blog since I started in 2014. 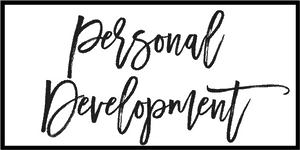 I spent a LOT of time educating myself and finding online courses and books for bloggers to grow their blogs. 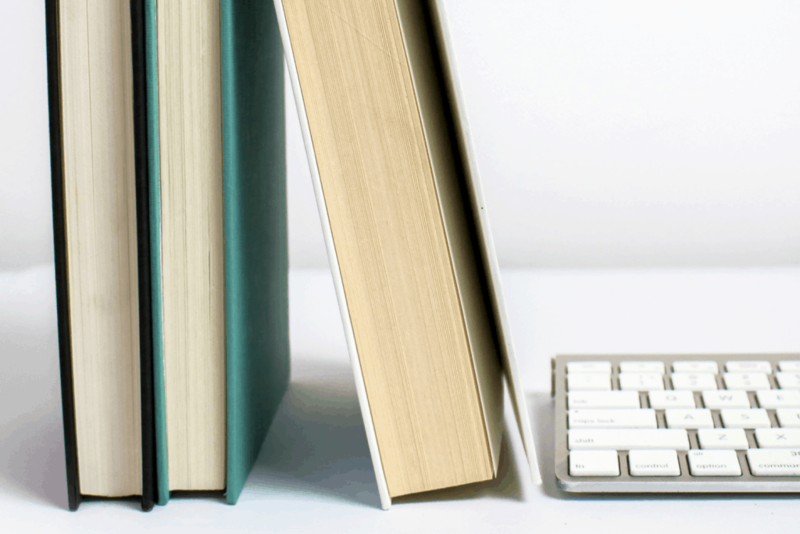 In this post, I’m sharing a few of my favorite books I’ve read that have actually helped me to grow my blog! I can honestly say that this is probably the most valuable book I have read that had a direct impact on my blog traffic. 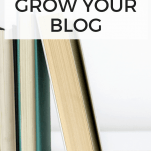 Even though I was already nearly two years into my blogging journey when I read this book for the first time, I still learned quite a few new tricks about growing my blog traffic. I love the strategy behind Lena’s tips, and I’ve seen success implementing some of them myself. This is a really great book to read if you’ve established your blog, but are struggling to continually increase your traffic. I’ve read this book probably three times now and find something new to implement every single time! You can grab a copy here. Natalie is a blogger who has figured out how to make some serious money from her blog. She made $8k the first year, $30k the second year, and $45k the third year. And this year? She’s on track to break six-figures. Luckily for us all, she wrote a book outlining every step she took to make $45k from her blog in her third year. She breaks her income down month-by-month and shares exactly what she did. I think we can all agree that Facebook is pretty frustrating, and attempting to get any traffic to your blog from Facebook is a serious struggle. There definitely seem to be some bloggers out there who have nailed the algorithm and get a ton of engagement and traffic while the rest of us flounder. Brittany, the author of Strategies Worth Sharing, grew her Facebook page from 2,000 likes to 100,000 in five months! I know, that’s insane. In her book, she shares how she did it (including how she gets the Facebook algorithm to work in her favor). This was the first book I read, and it still holds a dear place in my heart. I learned so much from Ruth in this book early on in my blogging journey and since then. I’ve read it twice, once as a beginner blogger and again later in my blogging journey when I had grown my traffic and was working on monetizing my blog. I can honestly say that the second time I read it, I got completely different advice out of it, simply because my needs as a blogger were different. It’s quite a comprehensive guide, and I would recommend it to any blogger. You can grab a copy here. Note: This book is pretty outdated now (last updated in 2014) but I still think the foundational information is super valuable to growing a blog! If you run a blog or online business, you’ve probably heard of this book. It’s basically become the go-to manual for aspiring digital nomads. I didn’t find every section of the book to be relevant for my own business, but some of the advice in this book is absolute gold. He talks about the importance and value of not just money, but time. This book will definitely change your mindset on time management and deciding what is really important. It also opens you up to new possibilities for living a lifestyle you’ve probably never even considered. I saw this book recommended by SO many bloggers, I finally had to check it out for myself. Whether you’re making money from your blog now or not, this book is a must-read. The book covers business finances across the board. One of the big takeaways is that he talks about how you should pay yourself FIRST in your business, and focus on profits instead of revenues. This book has definitely changed how I approach my business finances! You can grab it for yourself here. Sophia Amoruso is the founder of the online shop, Nasty Gal. You’ve probably heard of the book, and you probably also know that Nasty Gal filed for bankruptcy and went out of business. Well, don’t let that stop you from reading it. This book shares some AMAZING insights about starting a tiny solopreneur online business. One of my favorite things about this book is that I really trust her advice because of how relatable she is. Seriously, reading the story of how she started, it sounds a heck of a lot like so many other small online business owners and bloggers I know! 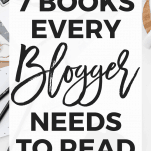 All of the books in this are sure to help you grow your blog! They all have something so different and so valuable to offer, so I would honestly recommend reading ALL of them! Thanks Kristin, so glad you’ve found the list helpful! As a newbie, I think you’ll get a TON of out of these! SO GOOD. 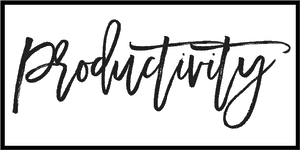 I’m admittedly awful and getting and reading and implementing blogging books…I need to retrain my attention span and get to reading! I can totally relate to that! I have started keeping a to-do list next to me while I read them, otherwise I read and highlight and then fail to go back and implement what I highlighted. Oh I need to check some of these out. I always love finding new books for the blog! This is awesome! 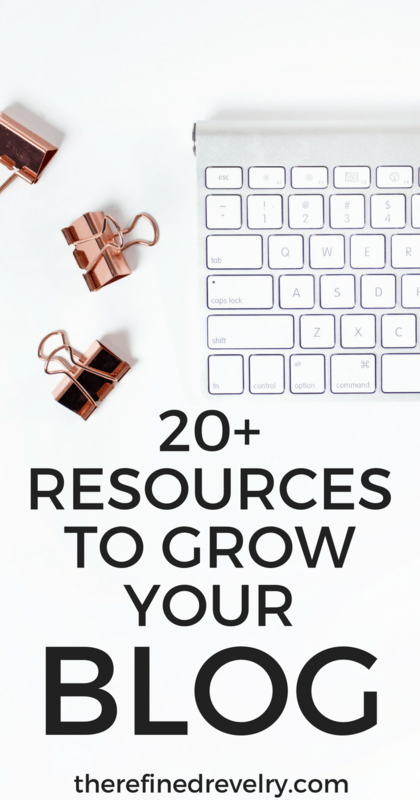 I am always looking for resources to help grow my blog and this is so helpful. Thanks for putting this together. I am saving this! Thanks Elizabeth, so glad you found it helpful! The first one has been on my wishlist for quite awhile. I really need to get it and actually read it! YES, time to pull the trigger! 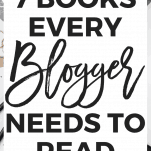 I have been looking for books to help help me grow my blog, so thank for giving me this list. 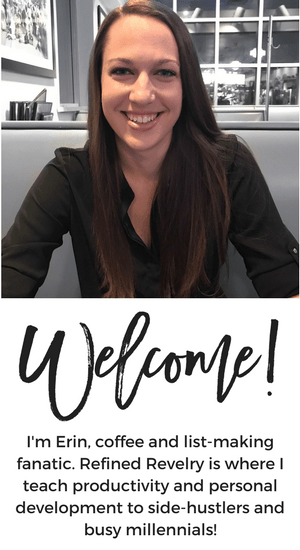 Thanks great – Thanks Lanae! I absolutely love “How I Went From 17K to 350K Pageviews in 9 Months.” Best blog traffic ebook I’ve ever purchased! I’ve heard so many good things about “How To Blog For Profit.” I’m going to have to check it out with my Kindle Unlimited subscription. SO glad to hear you enjoyed it too! It’s actually been awhile since I read it and I was thinking of readying it again! Thanks Carly – so glad you found it helpful! So many awesome books here, Erin! I definitely want to read the 17k to 350k book. I’ve heard such good things. Thanks Jenny! It was definitely a helpful book. Even after two years of blogging I learned a lot! Streamline Your Side-Hustle was so amazing! I took so many notes while I was reading it. Building a Framework was also a really helpful ebook. I’m going to look into your other 2 recommendations too. Krysta, I’m SO glad you enjoyed it! I just added all of these to my list of “Must Reads!” I can’t wait to check them out! I’m so glad you found it helpful! Thanks Stephanie! 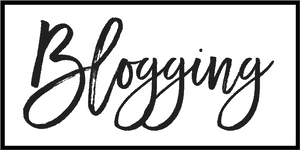 I’m always looking for new tools to help me with my blog! That’s great Kimberly – Thanks! I have Building a Framework and it was very insightful. Need to check out some of the others. So glad you enjoyed it – Thanks Louisa! Thanks fro posting. I love finding ways to improve and one book on this list I hadn’t heard of! I know what I’ll be doing this weekend. Interesting list! Going to add them to my Goodreads “want to read” list. I’m definitely going to check out Building a Framework based on your summary. That’s great Courtney, I’m so glad you’re going to check them out! This is an awesome list, thank you! I don’t have any yet but I’ve been looking for as many resources as possible. Thanks Kristin, I’m so glad you found it helpful! Yep, I definitely understand that! I’m the same way! Yes, definitely give it a ready! It was hugely helpful! The first book on your list sounds like a good one! I’ve read several marketing books that have helped me with general strategy for my blog, but none that are specific to blogging. Great info! I just read the 4th, but I may read them to grow my blog f4freelance.com.